Aloha Friday: Internet/Social Media Breaks? Today is the last in a long line of Jewish holidays. While I’m not Orthodox, I do stay offline during these holidays just like I do for Shabbat every Saturday. Of course, this year, the holidays fell on Thursdays and Fridays leaving me offline for 3 days straight for 3 out of the past 4 weeks. By the time it was over, I was itching to get back online. Still, I actually like being offline every now and then. It’s nice to forget about whether this person has a new blog post, whether that person has tweeted something new or whether there’s a new and interesting e-mail in my inbox. Instead, I focus on whether my sons have a new game to play, whether my wife has something new to talk about and what new and interesting things we can do as a family. 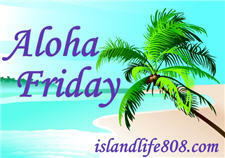 My Aloha Friday question for today is: Do you take regular Internet/Social Media breaks? Yes Every now a then. The weekends I tend to program things and not get on, However if everyone else in this household is on the net, I will visit folks and comment. Sometimes, yes…especially when on vacations for visiting family and such. I usually do not spend much time online during the weekends. It is nice to have a break every now and then.